For the last several years, fast food feuds have kept people on the edge of their seats with Twitter beef, sign wars, and one-upping campaigns. Some rivalries, such as Wendy’s and McDonald’s, are well known and ongoing, while others faded away after their fifteen minutes of flat top fame. Fast food companies have parodied Starbucks and McDonald’s, stolen competitor’s discount tokens, and engaged in a thrilling love story through their storefront signs. Learn about fast feuds you didn’t see on Twitter and companies you didn’t even know were feuding. Which of these sass battles will make you laugh the most? See which fast food chain roasted another competitor through a Superbowl ad . . . In Europe, McDonald’s was shocked when they lost the trademark for their Big Mac sandwiches after suing the Irish chain Supermac’s. 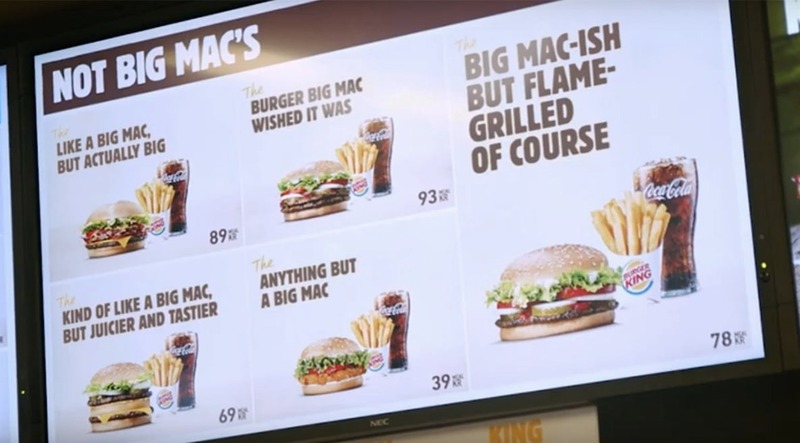 To add salt to the wound, Burger King in Sweden swooped in for the chance to change their burger names to McDonald’s parody names. Despite introducing some natural beef into their patties in 2018, McDonald’s has primarily used frozen patties. Wendy’s has always claimed to use fresh meat. Wendy’s marketing department discovered that 90% of their customers also went to McDonald’s, so they decided to lay out the distinction between the two during the first quarter of the Superbowl. In the ad, Wendy’s displayed a section from McDonald’s website that said their patties were “flash frozen.” They responded. “The iceberg that sank the Titanic was frozen, too. (just sayin’).” Following the campaign, Wendy’s Twitter followers shot up from 1.4 million to 2.3 million. Instead of lashing back, Arby’s went along with the joke. They sent sandwiches to the studio. When Stewart left the show, Arby’s tweeted their hiring link at him. 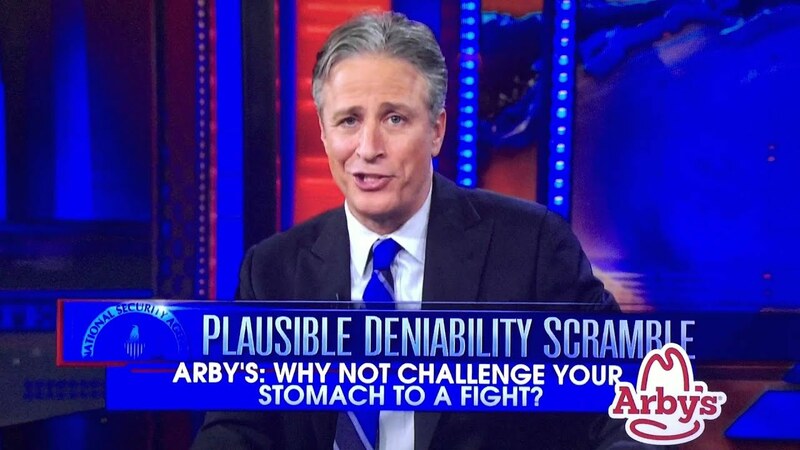 In the end, Arby’s announced an off-menu item named after Stewart and bought two ad slots on the show to say goodbye. 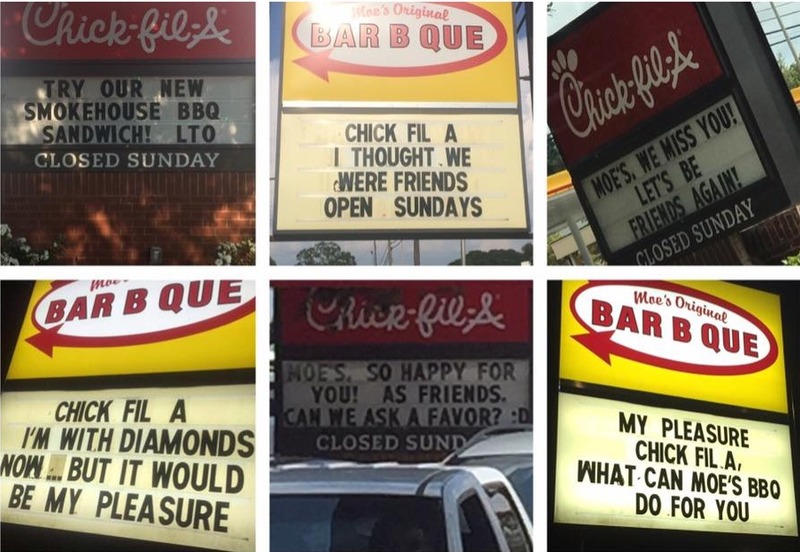 Guess which fast food chain managed to feud with every other competitor through one genius marketing scheme! 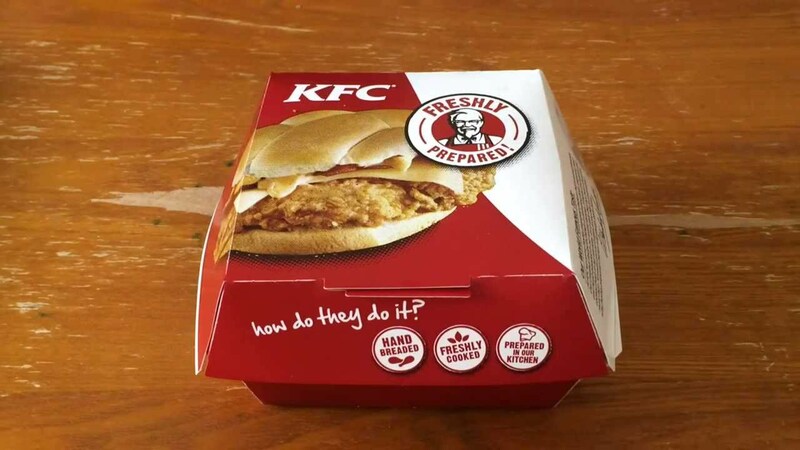 KFC created a savage campaign in 2010. In July of that year, the chicken chain offered free Doublicious sandwiches to the first ten employees of competitor fast food chains. The catch: they had to wear their work uniforms. The company even offered “Sandwich Amnesty” to anyone who lost their jobs by betraying their company. They simply offered them a job at KFC instead. It was a savage marketing scheme to advertise their new sandwich to competitor employees. Coming up, the most popular coffee chain gets parodied through an inventive pop-up cafe . . . When Burger King’s sales slipped in December 2018, they sent customers to McDonald’s for a one-cent Whopper in their #WhopperDetour. 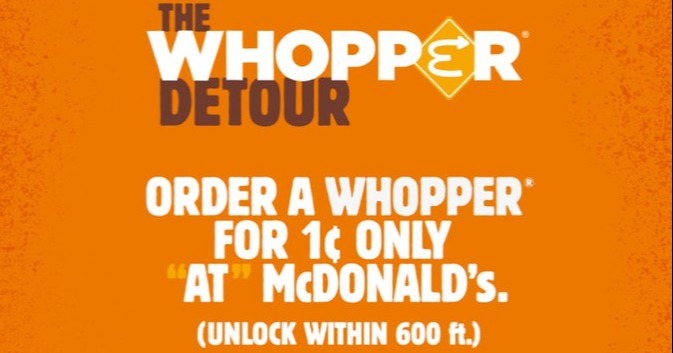 If customers parked within 600 ft of a McDonald’s, they could unlock a Whopper for a penny using the Burger King App. Just before this, McDonald’s had launched a deal where you could buy fries through their app for only $1. Burger King decided to increase their revenue by one-upping McDonald’s app deal. For the promotion to work, Burger King had to geofence over 14,000 McDonald’s locations. They didn’t even tell McDonald’s it was coming. Starbucks has taken over the coffee business in recent years with few competitors. To gain back customers, Nestle’s Nescafe coffee opened a pop-up with everything Starbucks has–coffee, outlets, free wifi–except no baristas. 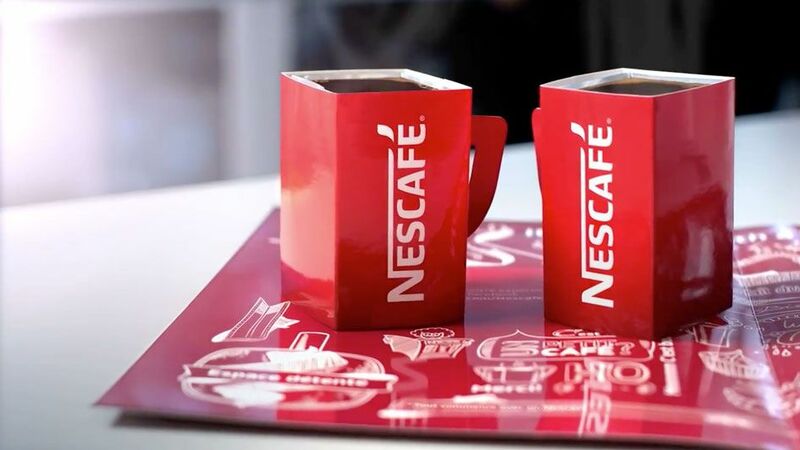 Yes, the Nescafe Coffee Taproom was a marketing spoof of Starbucks. In place of espresso machines, the shop offered self-serve hot water cups. Each cup had a misspelled name, “just like you get in those other coffee shops,” says the promo video. The cafe also included other coffee shop perks, such as visitors talking loudly on their cellphones and slow wifi. Wendy’s four for $4 Meal offered a full round of chicken nuggets, fries, a burger and drink in January 2016. When Burger King saw their promo post on Twitter, they fired back with the five for $4, adding a cookie into the mix. How did Wendy’s respond to the challenge? In the classic Wendy’s Twitter fashion, they said theirs included “edible food.” The tweet has since been removed, but Twitter users and news outlets still managed to screenshot it before then. See which two restaurant chains tried to take their feud to the Supreme Court! 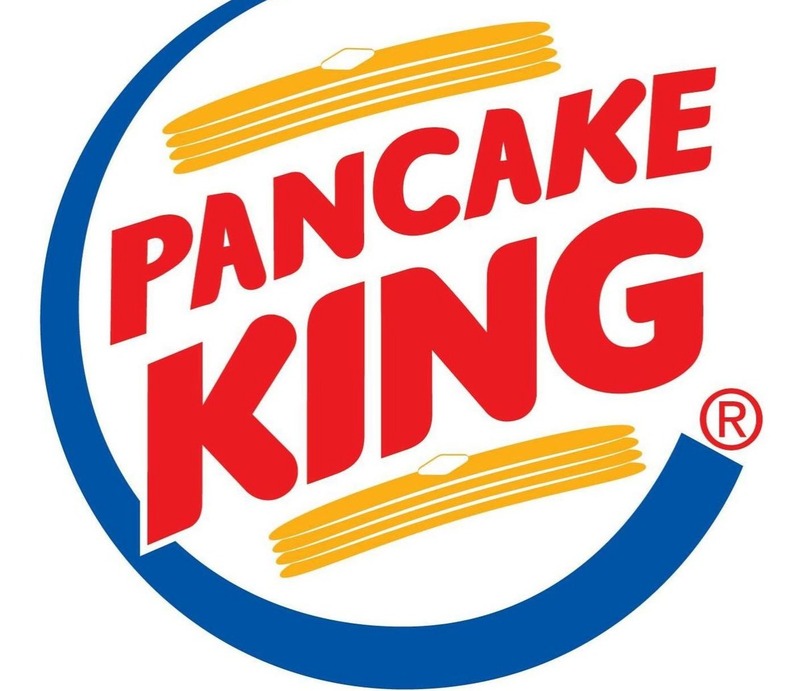 In 2018, IHOP decided to promote their new Ultimate Steak Burgers by making an unexpected name change to the International House of Burgers, or IHOb. Though IHOb didn’t intend for feuding, that didn’t prevent other food chains from pouncing on the opportunity. In 1997, Papa John’s and Pizza Hut entered a feud that only resolved after they petitioned the Supreme Court. It started with a co-founder of Pizza Hut appearing on a Papa John’s commercial saying he had “found a better pizza.” The advertising war between the two stores escalated quickly. Eventually, Pizza Hut sent vinyl punching bags to franchises with Papa John’s imagery. They even dropped Pizza Hut coupons on the door of anyone who ordered Papa John’s. 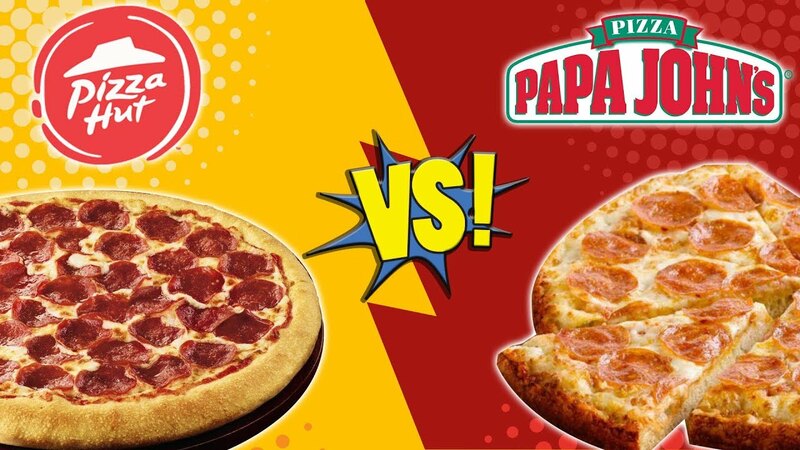 Pizza Hut sued Papa John’s for a misleading slogan, which Papa John’s appealed. Both companies lost millions of dollars in this feud. Pizza Hut isn’t the only company to rip on Papa John’s logo . . . In November of 2016, the CEO of Papa John’s expressed dissatisfaction with the NFL handling of players kneeling to the national anthem. Enter DiGiorno, mocking Papa John’s slogan with “Better Pizza. Better Sales.” They even temporarily changed their website slogan. Papa John’s fired back by changing their Twitter bio to “Frozen pizza = pizza equivalent of a participation trophy.” The response did not receive as much attention, and it seems DiGiorno’s move took the Twitter trophy. In January 2019, Burger King aimed to improve McDonald’s Big Mac by launching the Big King XL sandwich. The XL had 175% more meat than the Big Mac. Burger King offered a discount for the sandwich over GrubHub and another, better deal. For customers in the Chicago area, Burger King would give out a free Big King XL if you gave them a rare McDonald’s MacCoin. 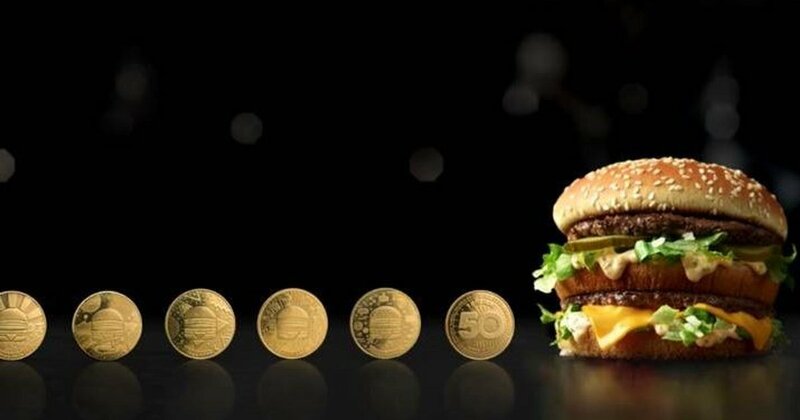 In August 2018, McDonald’s released 14,000 MacCoins for their 50th anniversary that could redeem a free sandwich. Now that they were expired, customers could turn them in for a free sandwich at Burger King. Coming up, three celebrities caught up in fast food feuds! 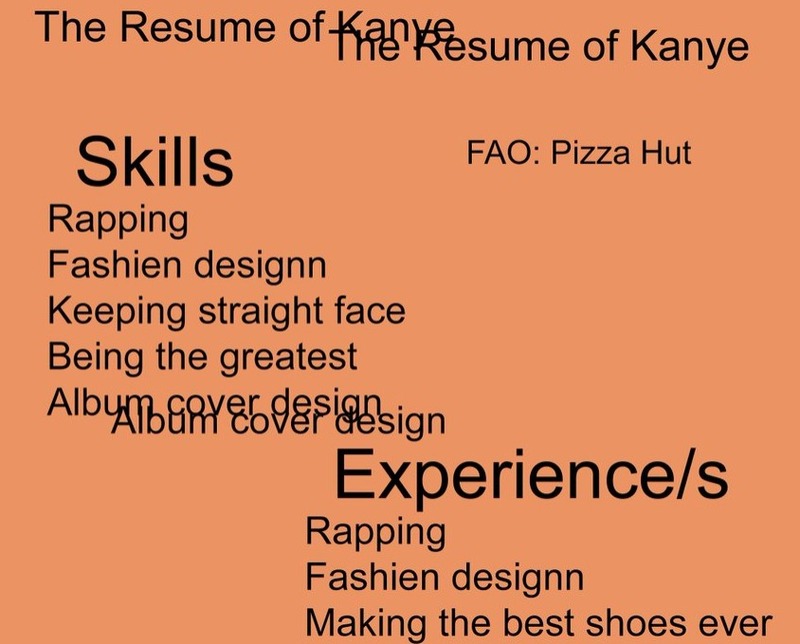 The resume mirrored his album listing for “God” with its overlapping text. The resume is covered with misspellings and lists sit-ups and baggy pants as experience. It also listed Taylor Swift as a reference, but crossed it off. “We’re sorry Kanye. We just can’t accept this,” Pizza Hut tweeted with the image. 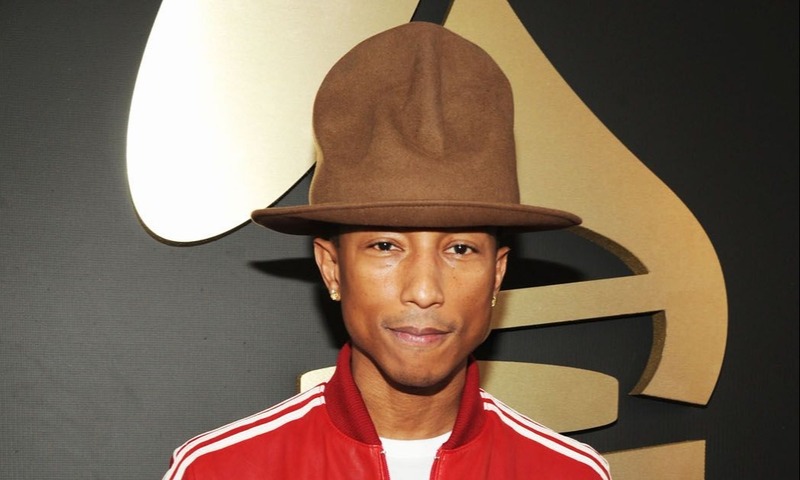 Rapper Pharell Williams wore a hat to the 2014 Grammy’s that was criticized by a lot of people, but most savagely by Arby’s. The tweet, “Hey @Pharrell, can we have our hat back?” hit almost 60,000 likes. Willams did take it lightheartedly, though. “Y’all tryna start a roast beef?” he asked in response. It wouldn’t be the only time Arby’s started roast beef, but it was a friendly beef in comparison to the other fast feuds. Coming up, fast food chains go up in arms over their breakfast menus. After Game of Thrones killed off Bud Knight in the recent Superbowl commercial, they were in need of a new food product king. 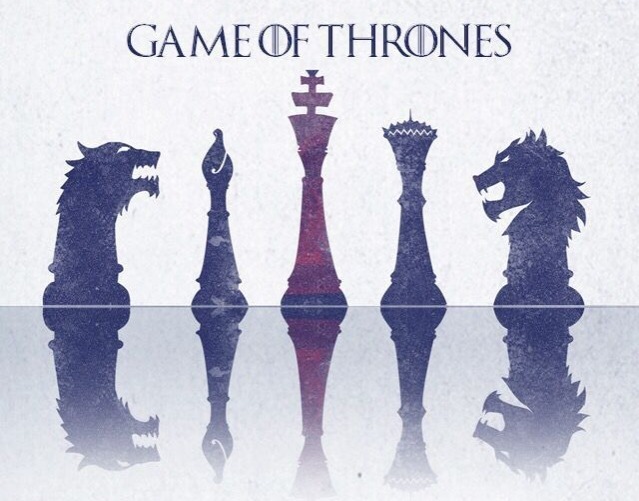 Fortunately, Wendy’s convinced Game of Thrones on Twitter to usurp Bud Knight as the new king. Surprisingly, the Game of Thrones Twitter responded to Wendy’s and confirmed them as a new king. Game of Thrones then made a jab at Burger King, saying “Any man who must say ‘I am the king’ is no true king at all.” Unfortunately, the king of burgers missed his chance. When Taco Bell released its new breakfast items for $1 across the board, McDonald’s all-day breakfast dropped in revenue. McDonald’s then added $1, $2, and $3 tiers. 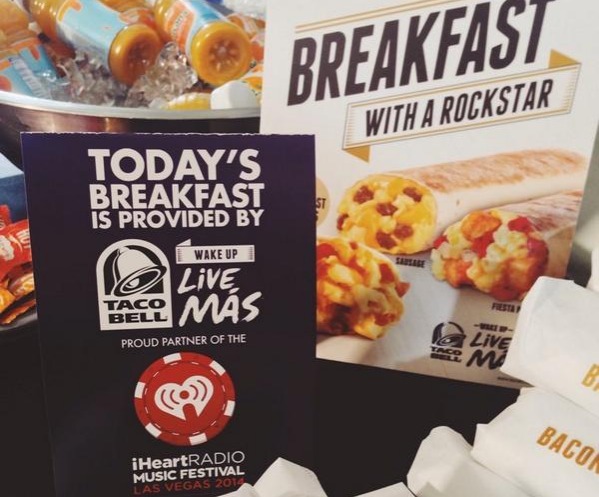 Taco Bell increased their advertising, and so did McDonald’s. Eventually, Taco Bell released a ruthless commercial as an advertising scheme. Taking the term “war” seriously, the commercial begins with a Ronald McDonald look-alike dictator forcing its citizens to eat Egg McMuffin-looking sandwiches. A group of rebels eventually escapes the society to a bright land of smiling faces eating A.M. Crunchwraps. Not much left for interpretation in this commercial. Dunkin’ Donuts has aimed to keep up with McDonald’s breakfasts since 2016, revising their drive-thru menu and deals. So when McDonald’s released Donut Sticks just before Valentine’s Day, Dunkin’ was quick to comment. “What a weird coincidence . 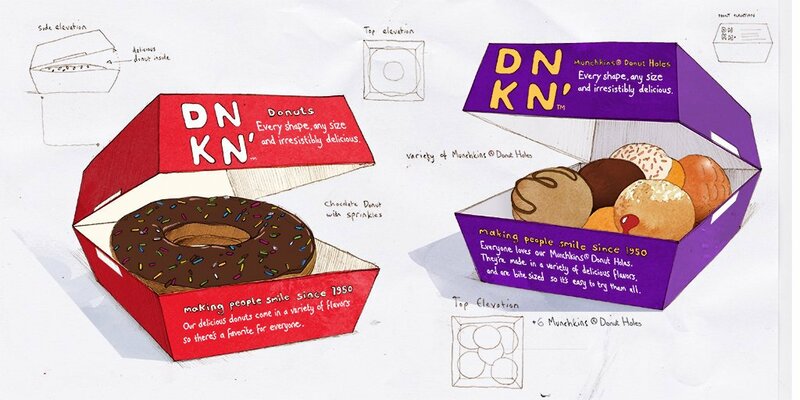 . . @McDonalds came out with Donut Sticks, and we just released the blueprints to our new donut packaging . . .” Dunkin’ tweeted, sharing a photo reminiscent of McDonald’s burger packaging. Dunkin’ clearly didn’t appreciate another restaurant copying the Donut Fries they released back in 2018. Their tweeted image copied McDonald’s products in return. Guess which company came under fire in an Old Spice tweet . . .
Carl’s Jr. made the mistake of starting a Twitter fight with Wendy’s in 2017. 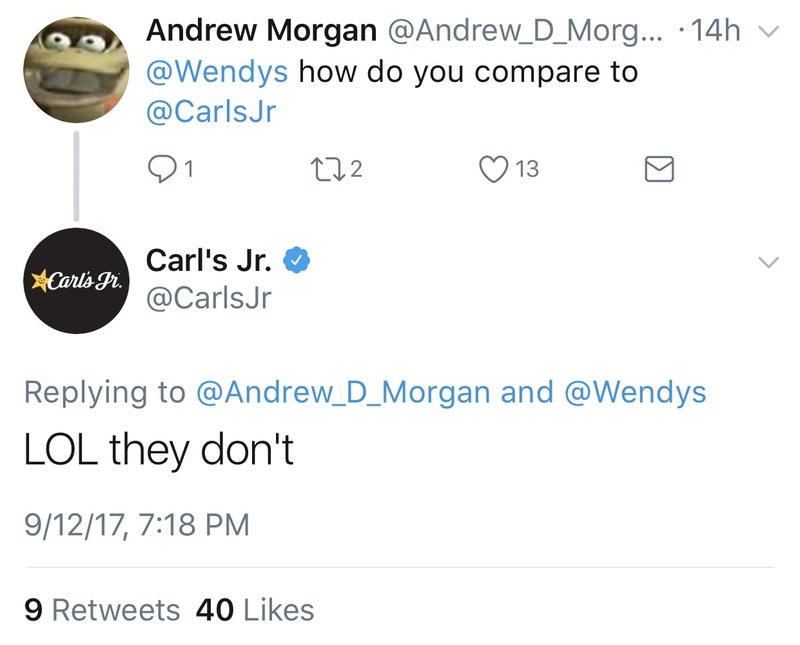 Twitter user Andrew Morgan tweeted at Wendy’s, asking how they compare to Carl’s Jr. That same day, Carl’s Jr. replied “LOL they don’t,” receiving few responses. Wendy’s didn’t immediately reply, lulling Carl’s Jr. into a false sense of victory. Half a day later, though, they landed the punch. “Yeah, for one, if we were going to diss another restaurant we’d have more than likes and RTs after 13 hours.” Unfortunately for Carl’s Jr, Wendy’s response got over 62,000 likes compared to their 1,000. Ouch!